Joanna Simpkins in Jinny at Derby Theatre. Photo: Robert Day. Sarah Brigham’s sixtieth-anniversary production of Look Back in Anger by John Osborne reclaims that play as a story of 1950s Derby. Jane Wainwright’s Jinny, performed on the set of Look Back in Anger, argues that Osborne’s play continues to be a local story. The latest in Derby Theatre’s ‘RETOLD’ series, Jinny is a one-woman show that reimagines the angry young men of sixty years ago as the passionate, embattled, angry young women of today. Jinny (not ‘Jenny’, as she witheringly informs her pretentious friend ‘Elinor-with-an-i’, the play’s version of Osborne’s Helena) is twenty-five and clinging onto her undergraduate days. Living with her pregnant best friend Liv (a nice twist on the inert Cliff), Jinny has spun a narrative around helping out her uni friends without fully acknowledging that she needs them to justify her own avoidance of shifting times. She is wired to social media, punishing Elinor by waiting a full minute before responding to her follow request on Instagram, and writes witty, angry guitar songs that she posts on YouTube. On the day we meet her, she has been offered an audition by a management company, and finally sees an opportunity to follow her dreams. The excellent Joanna Simpkins runs, cycles, screams, sings, fights, weeps and laughs through the worst day of her life as she sneaks out of her upper-floor flat window to avoid the landlady, dodges cars on Derby’s main roads, gets vomited on by a hungover student and finally crashes into her audition. 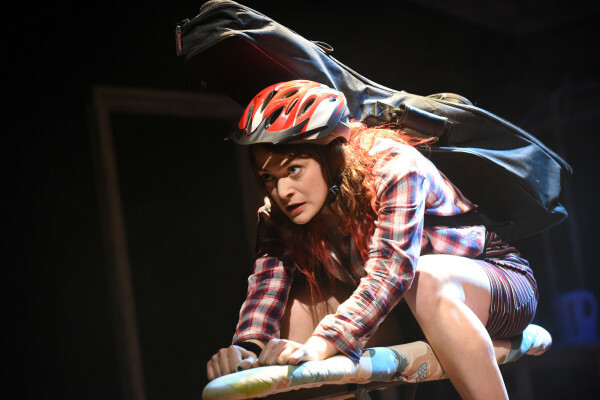 The props of Jimmy and Alison’s flat become her imaginative world; the ironing board doubles as window sill, bike and a billboard poster that bears the brunt of her rage when it finally boils over. There’s something thrilling about watching Jinny take the oppressive domestic anchor of Osborne’s play and turn it into a fluid and mobile embodiment of her breakneck approach to life. In everything she does, Jinny’s lairy, shame-free, gutsy take on her surroundings makes her a joy to watch. Ultimately, Jinny’s dreams are punctured by her own ties to the world. During the audition, a call from her ailing gran forces her into a pivotal decision – what if this is the last call she ever gets from her? Making the choice to leave the audition, she finds she has thrown away her chance at a deal to hear about her gran’s new boyfriend, and in a fit of anger and frustration she flees the venue, only to realise she has left her guitar behind. But Brigham’s sharp observational script makes clear that Jinny is auditioning for a false life; her musician persona is mouldable into a very specific image of commercial feminism, sweet and edgy, that the unseen Simon Cowell-alike looks forward to exploiting. The arc traced by Brigham and Simpkins is moving – Jinny first forces herself into a twee, Ellie Goulding caricature, nodding enthusiastically at everything she is asked to do; then, as she flees from the audition, she explodes at a toothpaste billboard that demands she ‘smile’, pummelling her fists bloody. Jinny aspires to be like the London-born friends who have breezed into Derby for university and gone on to follow their dreams, but she is simultaneously wedded to the streets and people of her home city. Her longings for her university days resonate at a time where increasing numbers of students study locally to save money; she is left bereft as her more mobile friends move on. The local references ground the play in a recognisable reality (on press night, there was a roar of approval for her musings on Derby’s famous backwards-walking man), and over the course of the play Jinny’s relationship with the city remains love-hate, a mixture of nostalgia, loving possessiveness and resentment. This comes together in her songs, as noisy and witty as the character herself, at one point rhyming ‘banker’ with ‘Donald Trump is a first-class…. y’know’. Whether through songs, auditions, social media, violence, phone calls or simply chatting, Jinny thrashes around looking for a way to express her complex feelings towards her friends, her family, her future and her city. In its single hour, Jinny creates a rich character whose complex relationships with twenty-first century popular feminism, socio-economic divisions in higher education, DIY artistic expression and a hyper-connected social sphere ring true. The furious pace of both script and performance climax in violence and outpourings of anger, and even if we anticipate that Jinny’s future isn’t as a pop celebrity, the collapse of a dream fought for so passionately is distressing. But the play ends on a note of hope, even as Jinny sits alone, abandoned by Liv and awaiting rejection. A ‘good luck’ card from her estranged mum implies that, just as she has never left Derby, so Derby has never left her. It’s a touching end to a play that perfectly reimagines Osborne’s ideas of entrapment and escape for a new generation. Jinny is on at Derby Theatre until 23rd march 2016. Click here for tickets.